FFAA group of students partaking in a team building activity. The National FFA Organization is now accepting applications for its 2010 New Century Farmer conference. The exclusive, highly competitive program is open to college of agriculture students who intend to pursue careers in production agriculture. Those selected to attend the conference will be among the first in the nation to learn about the latest technological developments in the agriculture industry, and will receive business management advice from top industry leaders. The program will also help students begin to develop a nationwide network of industry professionals and colleagues to whom they can turn for support when they begin their own farm operations. The conference is free to those who are selected and will take place July 19-23 in Johnstown, Iowa. The deadline for applications is March 15. Only 50 students will be selected to participate. 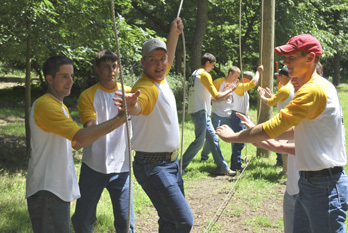 Would-be participants can learn more about the program and download an application at http://www.FFA.org/NCFarmer. The conference is sponsored by Pioneer Hi-Bred, a DuPont business; Rabo AgriFinance; Case IH; as a special project of the National FFA Foundation. Successful Farming is a media partner of the event. The National FFA Organization, formerly known as the Future Farmers of America, is a national youth organization of 506,199 student members – all preparing for leadership and careers in the science, business and technology of agriculture – as part of 7,429 local FFA chapters in all 50 states, Puerto Rico and the Virgin Islands. The National FFA Organization changed to its present name in 1988, in recognition of the growth and diversity of agriculture and agricultural education. The FFA mission is to make a positive difference in the lives of students by developing their potential for premier leadership, personal growth and career success through agricultural education. The National FFA Organization operates under a Federal Charter granted by the 81st Congress of the United States, and is an integral part of public instruction in agriculture. The U.S. Department of Education provides leadership and helps set direction for FFA as a service to state and local agricultural education programs. For more information please visit http://www.FFA.org.